Jessica's recruitment experience began with Mitacs, a research network at UBC. She recruited top-quality undergraduate students from priority countries to work with university researchers across Canada. 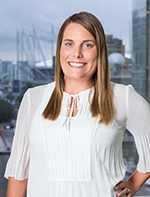 Prior to her career in recruitment, Jessica graduated from the University of Victoria with a major in Environmental Studies and worked with UVic’s Restoration of Natural Systems Program and the BC Ministry of Environment. Jessica had the opportunity to work on BC Parks initiatives, restoration projects and policy development in collaboration with First Nation communities. Jessica Miles is now one of our important Senior Recruiters here at Goldbeck Recruiting. She specializes in recruiting professionals for sales, marketing, and senior management in Production & Operations, Mining, Oil, & Gas, Forestry & Agriculture, Industrial Sales, Life Sciences & Biotech. Jessica has successfully filled very difficult searches for high level positions across Canada, the USA, Europe and Asia. Jessica takes great pride in the time and effort she takes to understand her client’s requirements and then methodically and thoroughly scouring all passive and active candidates in the relevant labour markets. Small or large, Jessica treats all companies equally like they are a VIP client. She finds fulfillment in learning about her clients’ corporate culture and forming long term partnerships.